Maui’d Forever has assembled a quality team of professionals who make dream Maui weddings and honeymoons a reality. 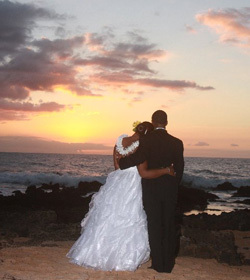 We can accommodate Maui weddings of all sizes, both small and large. We are your best option for planning a Maui wedding. Call us at 1-800-395-7807 today. When looking to plan destination weddings in Maui, you need to find the best local experts for friendly advice, guidance and planning. Maui Weddings – Packages start at just $399! Use our website to choose a Maui wedding package and preview some of the most fabulous locations for Maui Weddings available. Beach weddings at sunset are the most popular. Although we do offer other Spectacular Locations! Actvities: Maui’d Forever clients receive discounts up to 10% off all their Activities. You can even preview and price every Luau, snorkel trip, helicopter tour and more. Use us as your trusted resource for all your Maui needs. For Best info Call Bill Armstrong at 1-800-395-7807 or email him at bill@mauidforever.com today!